How much do the size and therefore weight of the guides (or rod rings, eyes etc.) affect how a fishing rod behaves? Please bear in mind that there’s nothing remotely scientific about my thoughts and opinions here, indeed I very much stand to be corrected if I have got things completely wrong - but the other day I got to have a few casts with a particular lure rod that one of our clients was fishing with over in Ireland, and it got me thinking. Which then leads to my bouncing brain syndrome and me needing to literally offload the contents of my head here on this blog………. Anyway, the rod in question was the rather impressive Major Craft X-Ride 8’9’’ 7-23g, lighter bass lure rod, a rod that I have never had here to test, but thanks to this rather nice repeat client, I have got to have a few casts with it over the last few years, and without doubt it is a rod that I really want to own. I have used the more expensive Major Craft Truzer 9’ 7-23g rod a fair bit, and my mate Mark was using one a lot until it went and snapped earlier this year - and whilst I am 99% sure that the Truzer and X-Ride blanks are one and the same (save for a few inches on these 7-23g lighter versions), from memory there seems to be a little bit of difference in the way the rods behave. I have never been able to put the two rods side by side for a direct comparison, so this is all from what I remember about the individual rods, but it seems to me that the lighter X-Ride is a smidgen “crisper” than the lighter Truzer. Whilst I accept that I could be imagining those slight differences, I can’t help but note how the Truzer has some very nice Fuji Torzite guides on it, yet the X-Ride has some cheaper but smaller again Fuji guides on the tip especially - and I wonder if this is making the slight difference to how “crisp” the two rods feel? Same with the longer 9’6’’ 10-30g X-Ride and Truzers - I really like both lure rods, and I have far more experience with the 9’6’’ Truzer than the 9’6’’ X-Ride, but again, this angler has the 9’6’’ X-Ride, and after a few casts with it the other day I can’t help but feel that the cheaper rod is a tiny little bit more steely or “crisp”. I am talking very small margins here, and it has to be based around my belief that the blanks are the same and it’s therefore the guides or rod rings making these tiny differences. 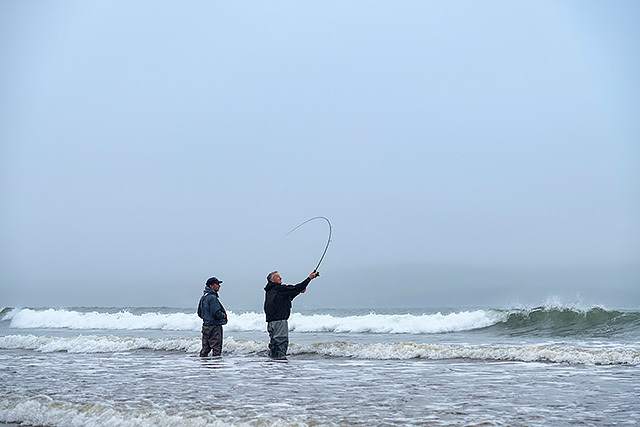 I’m not saying that one rod is better than the other, and please continue to accept that this is all pure speculation on my behalf, but as much as I’d love to have owned that lighter 9’ 7-23g Truzer for example, when I have a few casts with the 8’9’’ 7-23g X-Ride, I know that it’s the rod I would personally go for out of the two. Clip a DoLive Stick on and this rod is just sublime. Same with the IMA Salt Skimmer - a perfect combination. Would the stunning Major Craft Skyroad rods be as crisp and steely and responsive if they were built with larger and therefore slightly heavier guides for example? It makes sense that the size and therefore weight of the guides are going to make a difference to how a lighter fishing rod especially behaves, but how much? It can’t be a coincidence that so many modern fly rods often have those very lightweight snake type guides on them? I note that the two “budget” HTO Nebula rods that I now have experience of (the 9’ 7-35g here and the 9’ 12-42g here) both have very small guides on the tip of the rods especially, and I am convinced that these small and very lightweight guides are assisting in these ridiculously good lure rods feeling as steely and precise and plain bloody lovely as they do. Less weight on the tip section has to be a good thing. Sure, these cheaper Fuji guides aren’t going to last as long as the far more expensive Fuji Torzite guides that never seem to rust, but if you wash your rods down then does it really matter? I also wonder how many of us UK anglers are almost conditioned if you like to believe that bigger rod guides mean less tangles and problems? Crumbs, look at the size of the guides on modern carp rods as a classic example - do they really need to be that big? They look horrendous to me! I remember back in the day being told that you could not effectively use a spinning reel on a shore rod that was rung for a multiplier, but I gave it a go and never had a single problem. I also remember seeing those long shore rods in Namibia for the first time, all rung with tiny guides for multiplier use, and they are casting mono lines around 0.50mm with say 1.00mm leaders for the sharks with no worries at all. An old friend used to build my beachcasters at the time, but he would not have it that they could potentially be rung with much smaller guides than what we were almost conditioned to be using. I have never had a single problem with my braid on any lure rod I have ever fished with that has really small guides on them, and if I think back to a few lure rods over the years that have nearly but not quite done it for me, I wonder how many of them might be improved a touch if they were built with much smaller and therefore lighter weight guides? OK, so you can’t polish a bit of poo, but are there some rods out there that might easily be improved a bit by using smaller guides? Somebody sent me a couple of lure rods to try recently for example, but one of them especially just felt old school as such and didn’t do it for me at all, and it had far bigger guides on than I have seen on any modern lure rods for a while now. Would much smaller guides tighten the rod up a touch? Does it take a bit of a leap of faith to trust that very small and therefore very lightweight guides don’t actually cause problems with braid? And that the less weight you put on the tip of a fishing rod, surely the more “purely” it is going to behave? As in truer to the actual blank action before you go putting guides, whippings, varnish and reel seats on there. Whatever are the actual facts here, welcome to the contents of my head this morning! Is this kind of thinking remotely normal?